I decided since I have a backlog of bread recipes that I have made recently that each post this week will be for one of the different bread types I have tried. Breadmaking is one of my favorite things to do, and I make lots of different things all the time, to the point where I know have 8 different flours occupying space in my cabinets. I am always on the lookout for a new bread recipe to try, and this one from Cook’s Country for English muffin bread seemed like a good one to start with. I have made homemade English muffins before, and they turned out great, but the process can be quite time-consuming. This recipe offers you the same texture and chew that you expect from a traditional English muffin in bread form and it is much easier to put together. Grease two 8 1/2 by 4 1/2-inch loaf pans and dust each pan with cornmeal. Combine the bread flour, yeast, sugar, salt and baking soda in a large bowl. Stir in the warm milk until it is combined, about 1 minute. Cover the dough with greased plastic wrap and let it rise in a warm place for 30 minutes, or until the dough is bubbly and has doubled in size. Stir the dough and divide it equally between the two pans, pushing the dough into the corners of the loaf pan with a greased spatula. The pans should be about two-thirds full of dough. Cover the pans with greased plastic wrap and let the dough rise in a warm place until the dough reaches the edges of the pans, about 30 minutes. Adjust an oven rack to the middle position and heat the oven to 375 degrees. Discard the plastic wrap covering the pans and transfer the pans to the oven. Bake the bread, switching and rotating the pans halfway through the baking process, until the loaves are well browned and register 200 degrees on an instant-read thermometer inserted into the center of the bread., about 30 minutes. Turn the bread out onto a wire rack and allow the bread to cool completely, about 1 hour. If you are looking for a great bread to toast, this one is it. The texture is very similar to what you get from an English muffin, and it toasts up very nicely for you, giving you great flavor, crunch and chew. It goes very nicely with breakfast, but I also made myself a slice to have with some soup I was having for lunch, and it was the perfect accompaniment. I left one loaf out and froze the other, wrapping it in foil and then in plastic, so we can take it out whenever we are ready for another loaf. I haven’t tried it as a sandwich bread, though I am sure it would be okay; to me, it is a breakfast and toast kind of bread and one I will certainly make again since it is so easy to put together. My family loves English muffins. Of course, we all grew up eating the English muffins from the store and they are fantastic as a breakfast alone, with some eggs and bacon and are especially great with a hamburger for lunch or dinner. I have even made some Homemade English Muffins that were great and easy to make. When I came across this recipe from America’s Test Kitchen for English muffin bread, I was a little skeptical myself. I didn’t really see how a simple recipe like this would turn out and taste like an English muffin, but I was very pleasantly surprised. 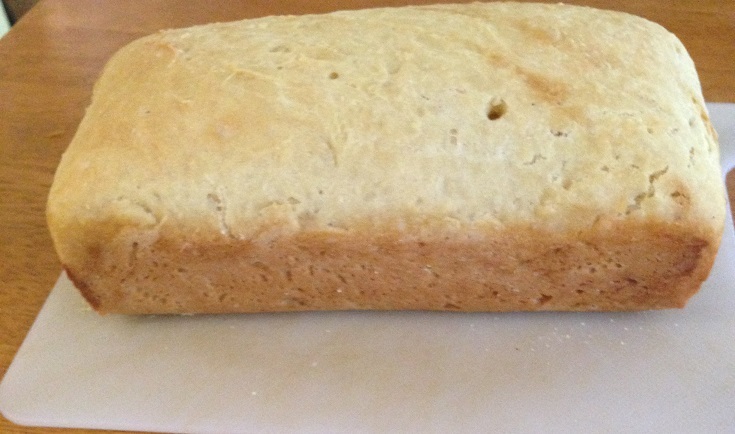 This is one of the easiest bread recipes you will come across and it is a great one to make for any occasion. This recipe makes 2 loaves of bread so you can always freeze one for another day. Grease two 8 1/2 by 4 1/2-inch loaf pans and dust each pan with cornmeal. Combine the bread flour, yeast, sugar, salt and baking soda in a large bowl. Stir in the hot milk and mix until everything is combined, about 1 minute. Cover the dough with greased plastic wrap and let the dough rise in a warm place for about 30 minutes or until the dough is bubbly and has doubled in size. Stir the dough and divide it evenly between the two prepared loaf pans, pushing the dough into the corners with a greased rubber spatula. The loaf pans should be about two-thirds full when you are done. Cover the loaf pans with greased plastic wrap and let the dough rise in a warm place until it reaches the edge of the loaf pans, about 30 minutes. Meanwhile, adjust an oven rack to the middle position and preheat the oven to 375 degrees. Discard the greased plastic wrap and transfer the loaf pans to the heated oven. 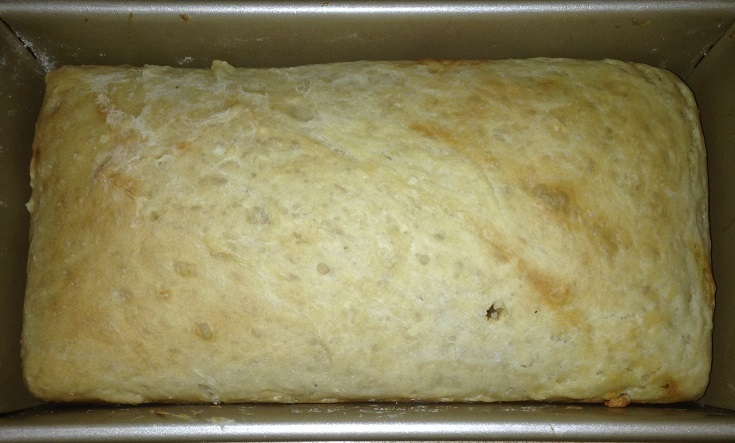 Bake in the oven until the bread is well browned and registers 200 degrees on an instant-read thermometer inserted into the loaf, about 30 minutes, rotating and switching the pans halfway through the baking process. Turn the bread out onto a wire rack and allow it to cool completely, about 1 hour. Slice the bread and toast and serve or just slice and serve. With just a few ingredients you can get a great loaf of bread. I have to say the texture of the bread is very much like that of an English muffin and while it may not have the nooks and crannies you love in an English muffin, everything else about it is perfect. The bread has great flavor and I served it with our dinner last night and then had some toasted this morning with my coffee and it was spectacular. This would be ideal to serve with a breakfast or brunch buffet or just to have when you feel like having a simple bread with any meal.